As we head into the action- and kitsch-packed Elate Eight, Scott and Tim offer another fun-filled episode of Monday Madness. This week, they warn the viewing public about the dangers of kitsch. While recording, Scott gets a phone call — which gives the SEC a chance to promote their gift to you: free Lent Madness ringtones. Don’t forget to watch Maple Anglican’s video for today also. Make sure you tune in to relive fond memories of Monday Madness in weeks gone by. By the way, if the SEC gets invited to Vatican City for a chat with Pope Francis, we’ll make a video on location. That’s how much we care about you, the Lent Madness public. This is here to facilitate social media sharing. Think of it as a free bonus — a classic, old-school freeze frame preview. Or whatever. Never mind. 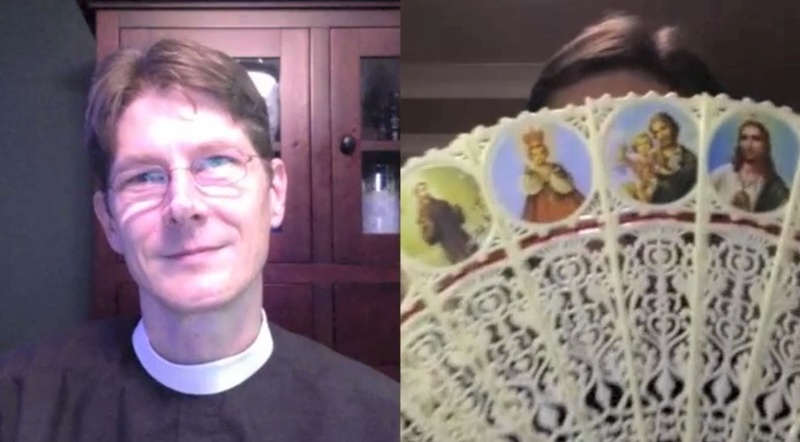 10 Comments to "Monday Madness — March 18, 2013"
When you go to Vatican City, please do bring the saintly fan and the “What Would Jesus Wear?” set–maybe you can swap with the pontiff for his Pope Soap on a Rope and/or his Popeal Pocket Fisher of Men. No comment, unless I need one. I wonder whether or not I should be praying for you two, a/k/a/ the Supreme Executive Committee. You’re getting further and farther/further (?????) out there. If you do get invited for a little popesy to-do, ask where Benedict left the Prada Pope red shoes he wore after his official “do” and raised his arms to bless the “pipple”. No more pomp under any circumstance! Days of austerity ahead. As we are about to head into the saintly kitsch round, I feel it is appropriate (insofar as anything to do with kitsch is ever “appropriate”) to share the following items of Jewish kitsch…”forerunners” of saintly kitsch, as it were. Please – enjoy! Where, oh where, can I get that fan? I want that fan so bad. I would be happy to share with you my Jesus Action Figure or my Jesus DELUXE Action Figure with glow-in-the-dark-hands, fish and loaves of bread and a water jug that turns water into wine. I also have a Moses Action Figure but have not seen any Old Testament Saints in the running. An idea for next year? It’s now Tuesday and I’m voting for Jonathan because….I was born near Keene and have a home there as well. One of my priests has even visited there. So, it must be special. And, for the piece de resistance, my former priest was a schoolmate of Jonathan’s in seminary. Hello — I’ve enjoyed the site, kitsch and all. Two comments: the article on Therese of Lisieux was one of your rare misses. It trivialized a saint many consider the patron of and those suffering from depression and a loss of faith. Check out Simon Tugwell’s essay on her in his book Ways of Imperfection for a more complete understanding of her. Also, I’d like to make a modest proposal. Next year don’t include any people from the 20th or 21st centuries. This would force voters to reflect more on historical significance, historical context. Along with the kitsch, of course. I’ve been enjoying the site, kitsch and all. Two comments: your article on Therese of Lisieux was one of your rare misses. It trivialized a woman who many consider the patron saint of people suffering from depression, especially when mixed with a loss of faith. Look at Simon Tugwell’s essay on her in his Ways of Imperfection, for a better understanding of her. Also, a modet proposal: next year, don’t include anyone from the 20th or 21st centuries. This would force people to deal with historical significance, historical context. Along with the kitsch, of course.